Sn0wbreeze 2.3b1 is now available for Windows users to jailbreak iOS 4.3 running on iPhone 4, 3GS, and iPod touch. Just like PwnageTool for Mac, Sn0wbreeze jailbreak is also tethered for all devices, which means you will have to boot into a jailbroken state every time you reboot your device. Note: There is NO unlock for iOS 4.3 yet. If your iPhone relies on a unlock, DO NOT update to stock iOS 4.3 yet. iTunes 10.2.1 for Windows (download link). Sn0wbreeze 2.3 for Windows (download link) . 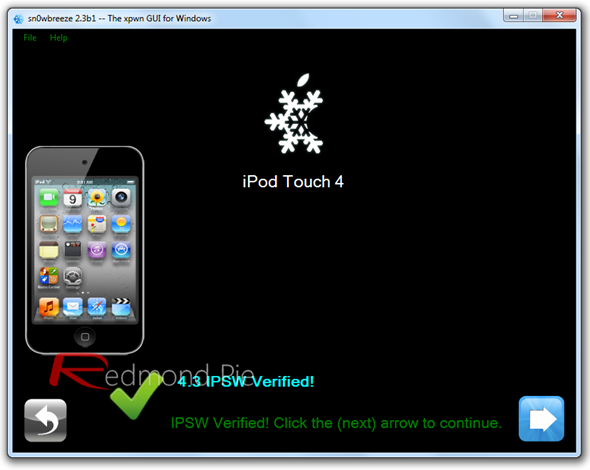 iOS 4.3 (Final) for iPhone, iPad or iPod touch (download link). Step 2: Run Sn0wbreeze on Windows and click next button. 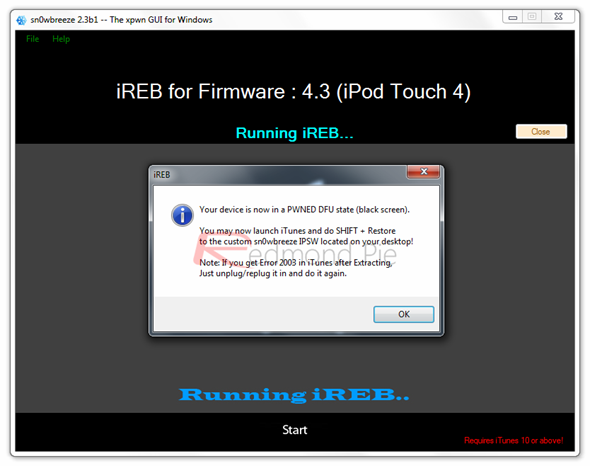 Step 3: In “IPSW” Selection Window, browse for the original iOS firmware .ipsw. Step 4: Sn0wbreeze first identifies the firmware. Once it is verified. Click next button to proceed. Step 5: When the following Window appears, select “Expert Mode”. 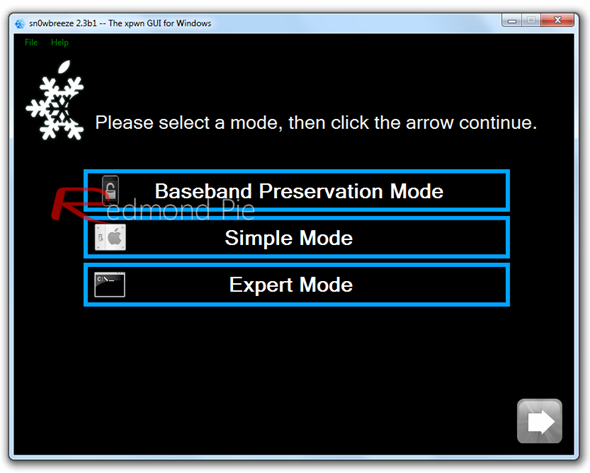 If your iPhone relies on unlock, select “Baseband Preservation Mode” instead of “Expert Mode”. Then click Build IPSW. The progress bar on next Window will show how much time is remaining as sn0wbreeze builds the custom firmware. You can also play Pac-Man to pass time. Step 6: When done, sn0wbreeze wil show the following Window. Step 7: At this stage, you need to enter your iOS device in DFU mode. Sn0wbreeze will guide you to enter your device in DFU mode. See the screenshot below. When your device enters DFU mode successfully, you will see the following message. Hold “Shift” key and press “Restore” button. A file browser will open prompting you to select the location of your custom firmware 4.3 .ipsw file. Select and open it. Step 9: Relax while iTunes restores the firmware on your iOS device. Your device will restart to jailbroken state when done. It will be running iOS 4.3. Step 10: After running sn0wbreeze 2.3, iBooty (a utility) is extracted to the desktop automatically. Run it and select your iOS device from the dropdown menu. 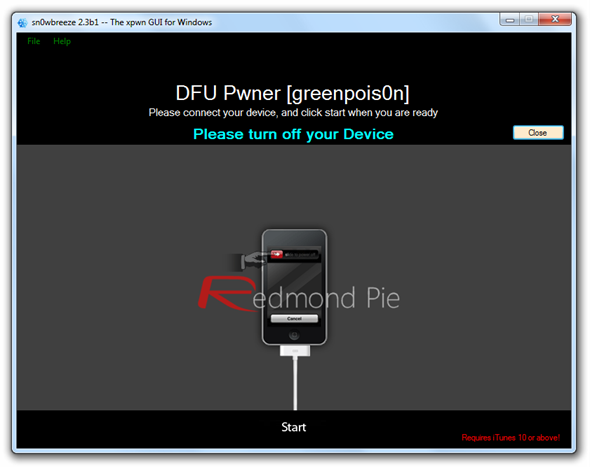 Step 11: Click “Start” and enter your device into DFU mode. Instructions will be shown as you can see in the screenshot below. Step 12: iBooty will do the rest for you once it detects that your device is in DFU mode. your iOS device will restart in a jailbroken tethered mode.